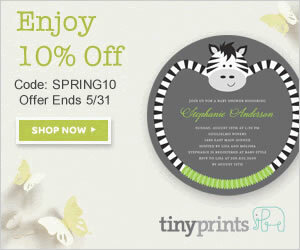 Save on Custom Cards at Tiny Prints all weekend! Tiny Prints is keeping up the holiday spirit with 25% Off Holiday Cards Sale now extended through the weekend! You still have time to get a great deal on the best personalized holiday cards, Christmas cards, Hanukkah cards, holiday party invitations, and other custom photo gifts. and photo gifts at TinyPrints.com! For the rest of the weekend, through 12/02/12 just use Tiny Prints Promo Code WKDSALE1112 when you checkout to get 30% whatever you just created. If you’re a Tiny Prints regular, you don’t need me to tell you how incredible their stuff is. If you are not familiar with them, now is the time to check them out. Their site is easy to use and you can personalize all of the cards, invitations, gifts and more with your own text, pictures, and personality.